« My Keto Egg Fast Diet RESULTS! 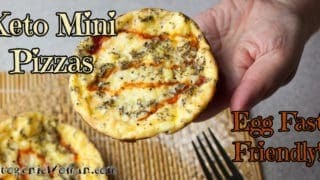 I tried this Egg Fast Recipe just this morning after seeing it posted in the Egg Fast Facebook group. 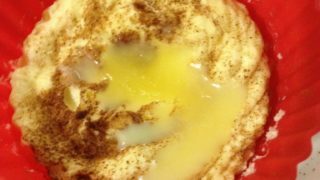 The original is called Eggs in Clouds and comes from this post on Framed Cooks. 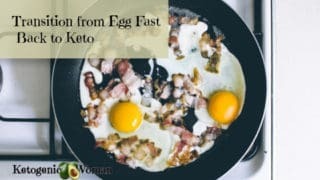 PS: You can find the instructions for doing the LCFH Keto Egg fast Stall Breaker Diet here. 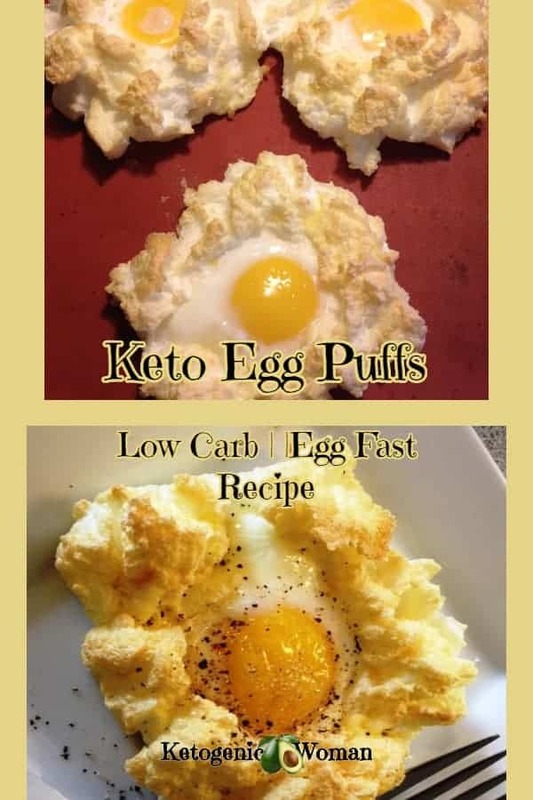 Also, these are great even when NOT doing the egg fast, these are just an overall great keto breakfast idea! I switched out the parmesan cheese for grated KerryGold Dubliner cheese which is my absolute favorite cheese. I would expect no less from KerryGold who also make my favorite butter! But please do use any butter and cheese you have! 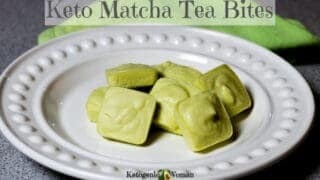 This was a very fast and simple recipe and the puffs were much bigger than I thought. Eating 2 of them with butter was very satisfying and filling. My one tip would be that I thought the yolks were too runny so I popped them in for an extra couple minutes. Next time I will simply put the yolks in at the start of baking. Remove from oven, drop one egg yolk into each indented puff. 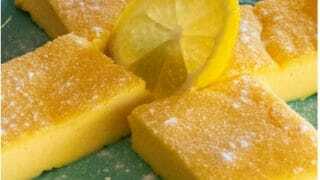 Remove from baking sheet with a spatula, sprinkle with salt and pepper, add your butter on top and eat! I am glad that I tried them and will make them again. Also because they are so pretty and easy, I would even make a platter of these for a party brunch sometime. I will be posting more egg fast recipes, time permitting. If you want to see my results from 4 weeks of egg fasting, read this post. 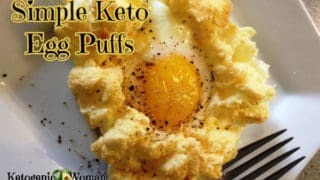 Update: These keto egg puffs are fantastic with this easy blender hollandaise sauce. 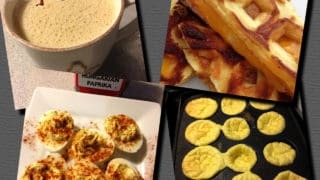 Tagged egg fast recipes, egg only diet, keto breakfast, lchf egg recipes, low carb breakfast recipes, low carb egg fast, recipes for egg fast. Bookmark the permalink. I’ll be making these real soon. Regarding the idea of the hollandaise on top, you could whip up the four egg whites and shape only into three puffs, using only 3 egg yolks, then use the fourth egg yolk along with 4 tablespoons melted butter to make the hollandaise. That way, you wouldn’t throw off your macros and have no leftover egg white. Yes! Thanks for your comments and idea! Hello can u have hollanxiss sauce on the egg fast ? I would save it for transition unless you have a way to make with only the egg fast protocol ingredients and you balance out the yolks with some eggwhites in your day. Is it ok to have a atkins shake in the morning? Not while on the egg fast. 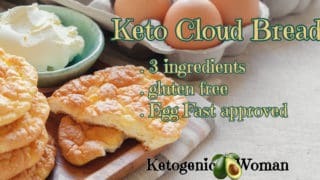 Personally I wouldn’t do it on regular keto either, too many ingredients I can’t pronounce. But those things have a place for emergencies. Hi, you’re the bee’s knees!! What a great result! A question that I have not seen an answer to yet: how much water do you consume each day on an egg fast? When you transition does it stay the same or change? And, I have read that you say most people do better with 8 eggs. Is that size dependent? I’m small 5’0/119 and do not have a lot of weight to lose, but I should be @ 110 lbs. Thanks for your time!! Hi, you’re the bee’s knees!! What a great result! A question that I have not seen an answer to yet: how much water do you consume each day on an egg fast? When you transition does it stay the same or change? And, I have read that you say most people do better with 8 eggs. Is that size dependent? I’m small 5’0/119 and do not have a lot of weight to lose, but I should be @ 110 lbs. Thanks for your time!! Realizing now I should have put this question in the “egg fast” section and not the recipe section. My bad! Many people say 100 ounces, I try to drink 6-8 glasses of water including my herbal teas. Being small you might do fine with 6 eggs/6 fats. It is more about getting enough protein for your body which is also size dependant so you might be fine. Did I answer this already someplace else, I am having deja vu! I strive for 8 glasses a day whether egg fasting or not. I don’t always succeed but I think people should drink as much water as they comfortably can. For the # eggs, 6 eggs/6 fats is the minimum in order for you to have enough protein. At 5′ that is probably an ok amount for you, so I wouldn’t worry too much about the 8 eggs. Unless you are hungry, then by all means eat another egg and fat. These puffs are so yummy!! We didn’t want runny yolks, so we cooked them a bit longer. Our total time was probably in the range of 10-12 minutes, but I forgot to pay attention. I just kept checking them until they were done. One thing to note is that they still look raw in too, even though they aren’t. So ours turned out closer to hard-boiled state and yet the puffs weren’t overdone at all. Very satisfying! My husband actually said they’d make a good addition to a brunch party! That’s a great compliment from him! If adding the hollandaise sauce are we still egg-fast friendly? Sounds delish for a meal at home, but some of your other options are better for lunch box items – thanks for all the great ideas. This makes the egg fast much more tolerable! Thanks! For me it’s all about portable since I eat 2 meals a day at work! As for the hollandaise, I tend to use it on transition days because while it’s technically ok for the egg fast, there is still the problem of having to figure out how to use the whites. My favorite thing is to toast leftover puffs and then put butter on them. Yummy! 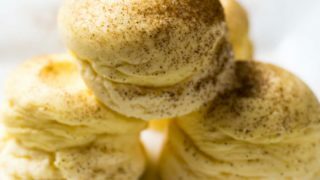 Hi ,could we make the puff for a dessert,if so, what kind of cheese would you use? Thanks. Hmmm, interesting challenge. It’s really like a meringue so maybe just a sweetened meringue? I’ll be thinking this over! its called a meringue when you make it sweet : ) google it, i make them chocolate sometimes. What about mascarpone? Sweetened with a lil stevia? Yes you can! I did this last time. I like them warm so I can have butter on top of hollandaise so you can either heat them in a toaster oven or bake them for a few minutes in the oven, just enough to warm them up. I have been using a hand mixer to beat the eggs but they aren’t thickening up. I don’t think I could do it by hand either. Although I have seen my mother do it! 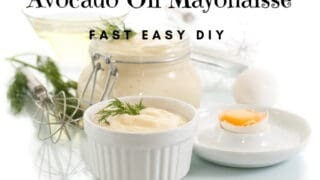 Unless you have strong arms and are willing to beat for a long time, you really need an electric mixer to get those stiff egg white peaks that you need for this. The trick is to start with a chilled bowl and then hold it in your arm at an angle angled whisk viscerally until they just begin to form peaks, and stop otherwise you will beat them to much and they will deflate again. It takes longer than with the machine. 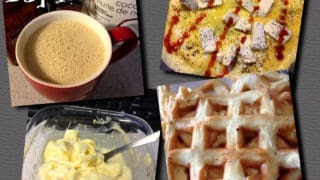 Try just one egg white to get an idea. I made these eggs for tea 2nite but they were a bit leathery on the bottom. What did I do wrong. My mother used 2 make these years and years ago. Maybe move them up into the middle of the oven instead of the bottom? A silicone mat is very helpful as well. I just wanted to drop you a quick but big “Thank you”! I love your recipes for the egg fast, you saved me from getting mad over those eggs. 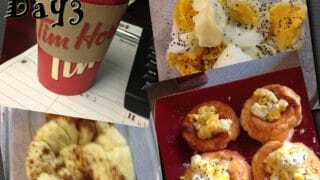 I just had the egg puffs, what can I say, simply yummy! 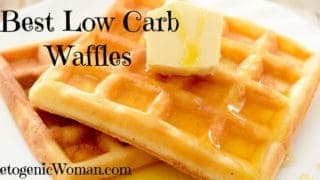 Good Morning, Am I just blind and don’t see it, but can you give me the Carb count please? Because it’s an egg fast recipe, we don’t count carbs on the Egg Fast. 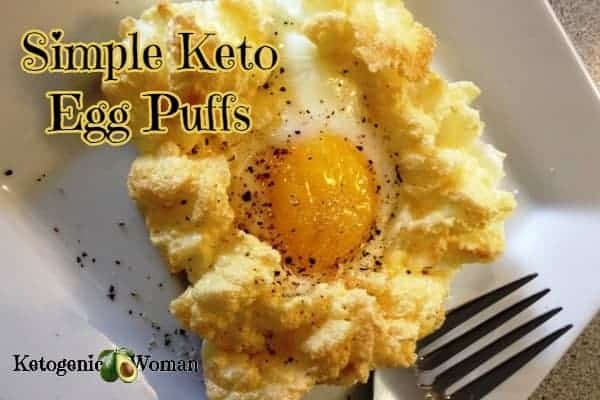 But since it’s just eggs and cheese it will be super low, I would guess 1 carb per Egg puff. Hope that helps! I need my egg yoke to be completely cooked. Can I leave it in the oven for a longer time? What does the egg puff taste like? 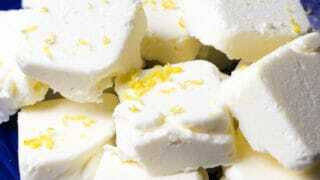 The recipe sounds like your making meringue but the picture almost looks like an egg sitting on a puffy biscuit. It’s kind of like a savoury meringue I suppose. I like them! How much of the butter do you use? The butter is not part of the Egg Puff recipe, it’s just to spread on top. So if you are on the Egg fast you would want to make sure that you have enough to equal 1 tbsp butter for each egg. Will have to try these. KerryGold Dubliner is my absolute favorite and I’ve turned my daughter on to it too. I’m always on the hunt for it. Seems to vary in price at different stores alot. Will have to try the butter now too. Do you leave your butter out or store in the fridge? I leave mine in the fridge. I find that Kerrygold is actually a little softer than regular butter and I have problem measuring out a tablespoon of it just straight out of the fridge. Do you have a Costco near? Best prices on Kerry Gold cheese and butter. Hello- a large whisk will beat eggs whites, or you can look for a hand held old fashioned gear type ‘egg beater’ the kind where you but the double beaters attached to a handle with a gear mechanism and turn the handle. Boy do I feel old. The whisk, will take some muscle and time but the French have been using the ballon whisk for decades if not centuries. The egg puffs are pretty aren’t they? I was thinking they would look gorgeous on a buffet table. I even eat them cold. I don’t have an egg beater but tried to make the peaks in my food processor with no luck. I did have a pancake looking thing with the egg yolk in the middle so I folded the edges over the yolk and it looked like a burrito. I also used a bit a habenero hot cheese in it and it was very good. So – I guess I have to have an egg beater to make the puffs? Yes, a food processor is more of a chopper where as to make egg whites into merangues you need something that will beat air into the substance. So short answer is yes you need an electric mixer/egg beater to make this. 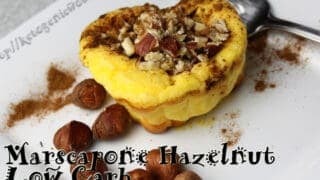 I have had mine for almost 40 years, they last forever and of course they are perfect for other things on an LCHF diet like making sugar free whipped cream based desserts. And they are pretty cheap as far as kitchen appliances go. Thanks for visiting my site! Is that all you eat on the diet is eggs & cheese? No, not at all! The egg fast is a short term fast (similar to Atkins Fat Fast only easier). It’s meant to break a plateau. If you want to find out what else you can eat, I have laid it out here.